"Really smart people in politics (or people who think they are really smart - Donald Trump) also have a tendency to want to substitute, by force, their judgement and decision-making for my own"
I like how you sneaked in that reference to Trump - jk - but very applicable. Well, typically, the more people know, the more aware they are of what they don't know. This is well-described in the Dunning and Kruger papers. The intelligent and well-educated people that I know tend to keep their mouths shut about topics they know little about. Whether it is in a small gathering, or in a large public platform, it seems that people reward the loudest/most assertive with their support. Often, the ones with the superior intelligence fail to counter or even question these people. Silence is not always a virtue. I used to think that but no longer. The most obvious example is university professors. These guys are smart, and their host institutions have promoted them because of it. They are also among the most verbal and talkative people in the whole world. The word "lecture" comes from these guys. They are frequently very narrow in what they understand, though, which can be very damage when they weigh in on policital issues. In particular, they have no idea about real-world social issues outside of the economy, because their social life consists mostly of students, each other, and political events. Trump is an idiot savant. He is an absolute genius when it comes to making money by means both fair and foul. He is a complete moron when it comes to everything else. He would also be another good example to put next to Hillary of a poor leader who surrounds themselves with sycophants and yes-men. Also, he's not exactly come about all his wealth in a manner libertarians would consider ethical. Anyway, having seen people like him in real life in Fortune 500 companies, he would be a yuge mistake as POTUS, no matter one's political affiliation. "one has to consider his starting point and compare his rate of return vs other alternatives. (Index funds anyone?)" Your choice of 1988 is odd. Donald Trump started with nothing and became a billionaire, and he did it more than once. Find someone else who's done that. "Also, he's not exactly come about all his wealth in a manner libertarians would consider ethical." Reading comprehension? "making money by means both fair and foul." "he would be a yuge mistake as POTUS, no matter one's political affiliation." No disagreement there, perhaps you missed this part of my comment: "He is a complete moron when it comes to everything else." "Reading comprehension? "making money by means both fair and foul."" Come on! You want to call THAT out, when it is really a point that agrees but from a different angle? Oh, and the Vote Up on your post was meaningless? 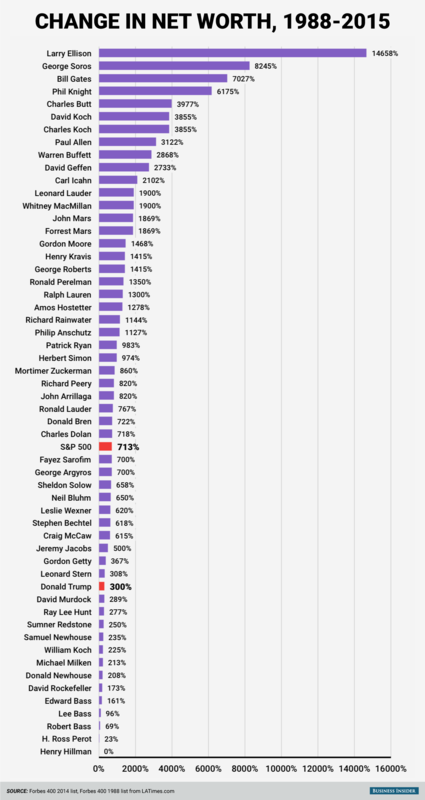 Not sure why (the chart constructed from Forbes data by IBD, so not "my choice"), other than it is one point in time that is documented by Forbes ranking of the richest. 1988 to 2015 seems sufficiently long enough to be a decent indicator. One could argue about the accuracy of the figures, but it would be reasonable to presume (without facts to the contrary) that Forbes has a reasonable estimate on available data. BTW, Bloomberg gives him a lower estimate for 2015. The point is clear, that even though he made billions, Trump could have converted that wealth into index funds, or their equivalent, in 1988, and made far more by 2015 without all that risk and roller-coaster ride. Even if you take Trump's self assessed $8.7B, that would put him at 770% growth (against the Forbes 1988 estimate - it should be against Trump's apples to apples self assessment for 1988), barely outperforming the S&P 500. And, let's not forget he should be evaluated against a risk weighted return. "Donald Trump started with nothing"
Now, did he literally start with "zero", like the rest of us average joes might have? He graduated in 1968, and in 1971 (or 1974), he was given control of his father's company. "In the mid-1970s Fred Trump lent his son money, allowing him to go into the real estate business in Manhattan"
Who has that kind of opportunity? Well, he does get credit for not losing it all. He more than doubled it, (roughly) keeping up with inflation. Mark Cuban would be more realistic story of the self made rags to riches story. Trump...hardly. Better to say that Trump's a genius at branding himself and using the media to his benefit. That arguably has had more impact on his wealth since the 90's than anything - allowing him to put that brand on the table in exchange for equity, and allowing him avoid any direct financial risk (while leveraging OPM - other people's money). Not really. See my response in this thread to the same question. In essence, not my numbers, but 1988 to present (27 years) should be a decent measure. Are you thinking the Black Friday market crash in 1989 is an outlier? Wonder what the value of his father's company in 1971? If we had those numbers might be interesting. Even if you assume only $50M, that's a ~10.7% CAGR vs ~7.3% for the S&P 500. Is 3.4% a good risk premium for that period? I would assume that Trump's investments were at their riskiest earlier in his life, and one can grant that his brand has been a factor in improving the odds for him since the 1990s. Don't have time to play the numbers, but intuition says that premium is low, even if doubled. "1988 to 2015 seems sufficiently long enough to be a decent indicator." The problem is that with Trump, in a way, it's actually too long. He's lost nearly everything more than once over that period and managed to build his wealth back up. I'm thinking the Taj Mahal which was acquired in 1988, which was at basically the peak of his wealth in the 80s (remember the Trump board game - it came out around then). At that point, Trump had already gone from millionaire to billionaire, but the Taj was one of his spectacular failures and bankrupted his business. In 1988, he's worth 3 Billion. In 1991, he's worth less than 500 million. So by changing the start year to 1991 instead of 1988, his growth in net worth increases by 6x. This is why start year matters. Mathematically, yes, but the big moves of those numbers also expresses the magnitude of risk, so definitely justifies a rather high rate of return to be evaluated against. From $500M to $3B in 24 years implies a ~6.9% CAGR, and S&P 500 was ~7.3%. It is clear from the wire link that Trump likes to inflate his numbers, but if we take his $7B number, that is ~11.3%. 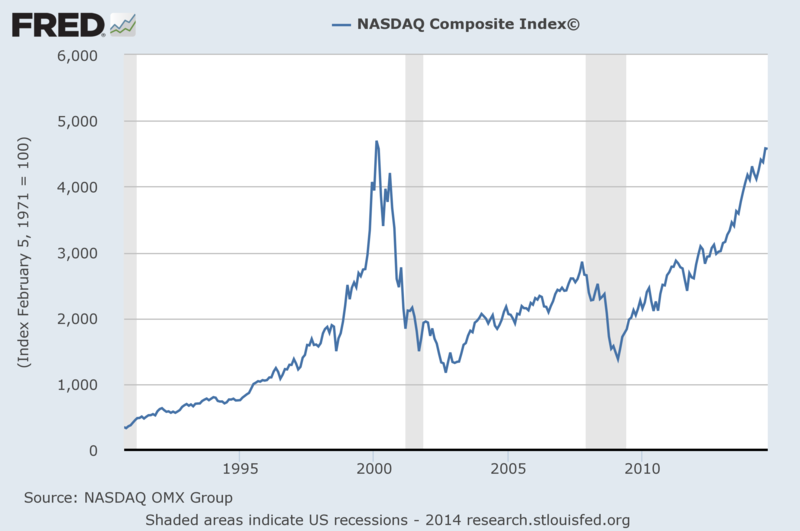 NASDAQ (probably a "safer bet" given the diversification) was ~10.6%. It is--in an odd way--why I think Trump would be better than Carson. Trump at least *knows* that everyone hates him and wants him to fail. He *knows* he's gonna have to fight like hell for anything he wants to happen. He *knows* he better have damn good arguments for his ideas. Carson *knows* that God's on his side, whispering in his ear, and that everything he wants is inherently the proper thing because otherwise God wouldn't inspire him to do it. If you say "hey Ben Carson, I don't think that's a good idea", then you aren't just disagreeing--you're going against God.